Alexander Spit released a tantalizing debut LP earlier this year called A Breathtaking Trip to That Otherside. Now the West Coast rapper/prouducer has a mixtape coming out that could make even more waves than his debut, judging by the first taste, “Valet Park, CA,” a blissed-out track with warped vocals. I doubt Valet Park is less a real place and more of a pun, but the displaced, quietly melancholic vibe he summons here calls to mind so many nowheresvilles of California. The Mantles sound a bit like they’re from New Zealand (home of The Clean, The Bats etc. ), but they’re from San Francisco, so hurray for us! This band hits all the right jangly notes, evoking The Byrds with their harmonic singing but in a perfectly disinterested way, while their guitars have swagger in addition to the jangle. “Hello,” indeed. Long Enough to Leave is due June 18 on Slumberland. San Francisco’s Sic Alps make wonderfully wandering psychedelia, but there’s a poppy focus to “Biz Bag” that makes it irresistible. It’s from their upcoming She’s on Top EP, due May 21 on Drag City. Listen to it via Pitchfork. Check out my interview with the band here. 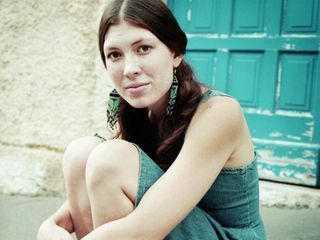 Last week gifted folkie Alela Diane debuted a new song from her upcoming album, About Farewell, the lovely “The Way We Fall.” Now she’s revealed the title track from her upcoming album, and it’s another stunner. “The brightest lights cast the biggest shadows, so honey I gotta let you go,” she sings hauntingly over a minimal arrangement. The album comes after the singer’s divorce, and her matter-of-fact nature gives its title track both rawness and resolve. About Farewell is due June 25 on the singer’s Rusted Blue label. Listen to “The Way We Fall” here, and check out an interview Diane did with the Amoeblog a few years ago here. Another great S.F. garage band? Sure! 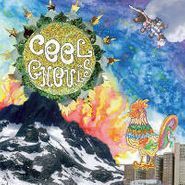 Cool Ghouls have a wonderful twanginess to their laid-back, melodic garage-rock that makes it go down like cool whiskey. Their self-titled debut album is out now on Empty Cellar Records. They’re playing all over this great state in the coming months, including May 15 at S.F.’s The Depot, June 8 at L.A.’s The Smell, June 13 at S.F.’s Phono Del Sol Fest and Aug. 3 at San Fradelic Psych Fest. Cool Ghouls - Natural Life from Robert Thomas on Vimeo. S.F. trio Burnt Ones have a video for their song “Web,” pairing the lo-fi psych song with similar visuals, relying on an unsteady cam and fun light work as the band plays from far away, sandwiched between plastic panes. Simple and great. Their album You’ll Never Walk Alone is out physically May 14 on Burger, and we have it now to download digitally. 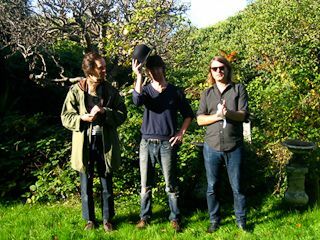 They’re at S.F.’s Thee Parkside tonight, Hemlock Tavern May 16 and the Eagle June 11, before taking off around the U.S. and Canada and arriving at S.D.’s Soda Bar July 13. Saturday: Ojai Escape! A folky retreat north to Ojai with bands Good Luck Thrift Store Outfit, Restavrant, Ocha La Rocha and Bloody Death Skull. It’s only 10 bucks, starts at 8 p.m. at the Ojai Deer Lodge.